i need to know how much it is to rent the tropical water slide on july 3rd. Hi – I’m interested in renting this for August 6th. Please email me with information. Hey…how much for this inflatable water slide for 8/6/11? Thanks! Hi Pam! We sent you an email including pricing information to the email you provided. 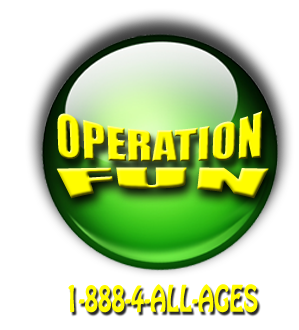 Thanks for contacting Operation Fun! i would like to know how much this water slide and the double water slide is for July 23rd Saturday for an all day rental ? Its depends on the length of your engagement. We dont have an All Day rental, it is based on hourly rates. We sent you an email at the address you provided us with water slide rental details. Thanks for contacting us. Have a great day Danielle! Please provide pricing for water slide rentals. My son is turning 2 on July 21st. I would love to have a waterslide at his B-day Party on July 23rd. Well first of all HAPPY BIRTHDAY to your son! We sent you an email regarding water slide party rentals to the email you provided us. Thanks for contacting us if you have any further questions feel free to call us at 1-888-4-ALL-AGES Thanks! Hello i would like to know how much the water slides are for August 20, 2011. Thank you! Hi! We send you an email with water slide rental pricing to the email address you provided us with. Thanks for contacting us! Have a great day! We have several water slides so Im sure we will have one available for the day you have requested. We are sending over an email with pricing information regarding the water slide rentals to the email address provided. Thanks for contacting us. Have a wonderful day! Please advise of water slide price and availability for August 25.